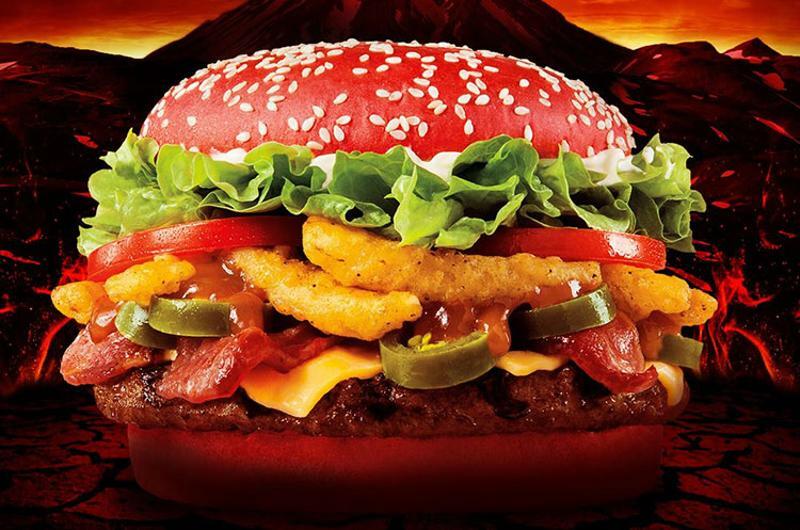 Burgers haven’t just seen an evolution in the past 20 years; they have experienced an explosion. No other popular food has enjoyed anything close to the radical rethinking and re-evaluation that has been applied to burgers. What used to be dismissed as the humble hamburger—a low-price, working-class staple—has been elevated to a food that’s found on menus in some of the best and toniest restaurants. Burgers have names; they have multiple ingredients and multiple culinary influences. They have cachet. What constitutes a burger and what makes for the ideal burger continue to shift. New influences, global or environmental, continually reshape burger builds. 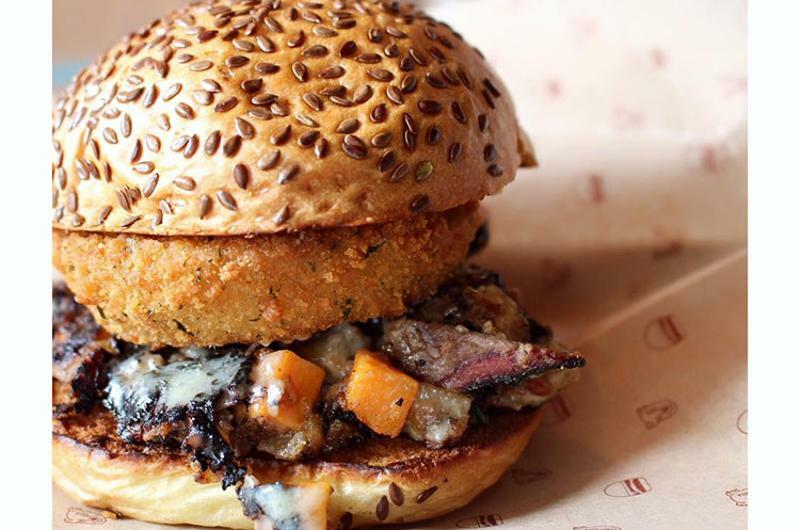 At any given time, a dozen or more burger trends are at work in the restaurant arena. 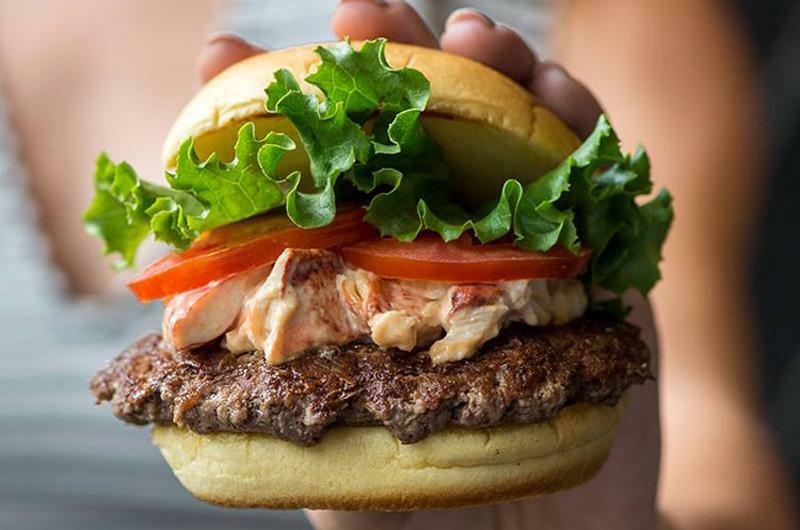 We’ve chosen 10 trends here—with five burgers to represent each—that are emblematic of the boundless and boundaryless inventiveness that keeps bringing back customers for another burger. 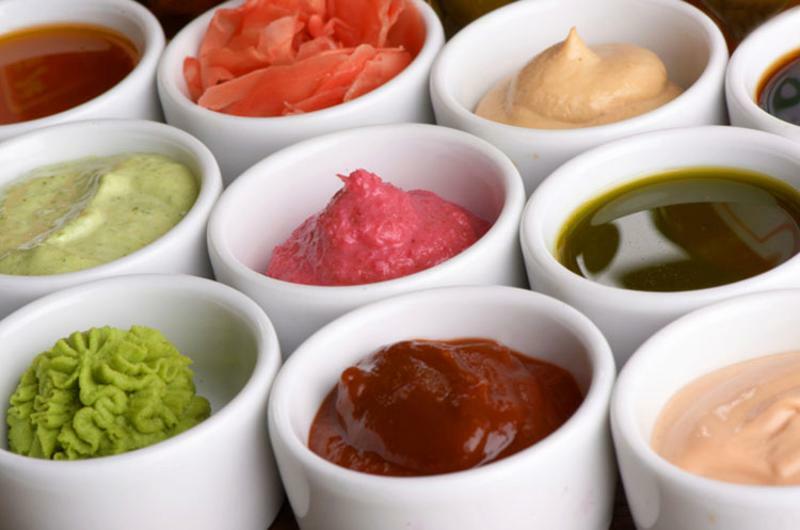 No burger trend has taken hold more quickly than the adoption of the belief that a burger isn’t complete without a sauce, aioli, chutney, marmalade or other condiment. The contemporary burger is all about layering flavors—and sauces do that well. They also provide an avenue for introducing international ingredients and flavors. Restaurant: Honest Abe’s Burgers & Freedom; Lincoln, Neb. 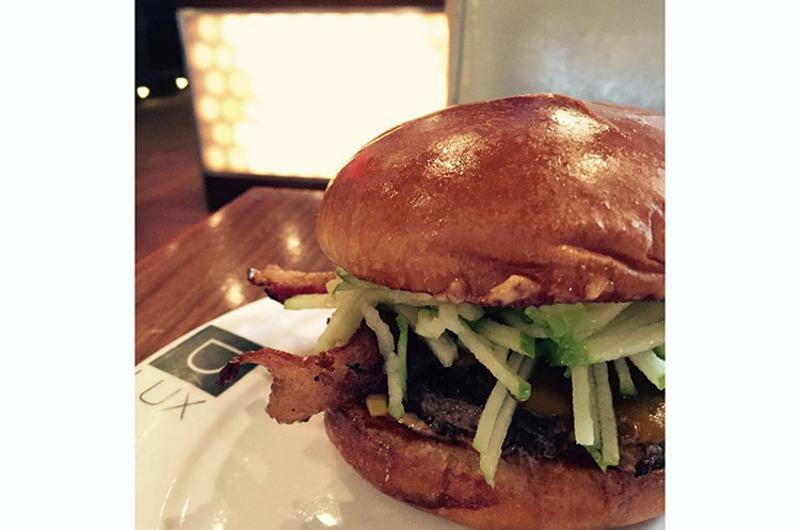 A 6-ounce beef patty with red pepper pesto, candied orange aioli, bacon, smoked Gouda and romaine. With a spicy goat cheese, charred frisee and housemade apricot mustard on a potato bun. 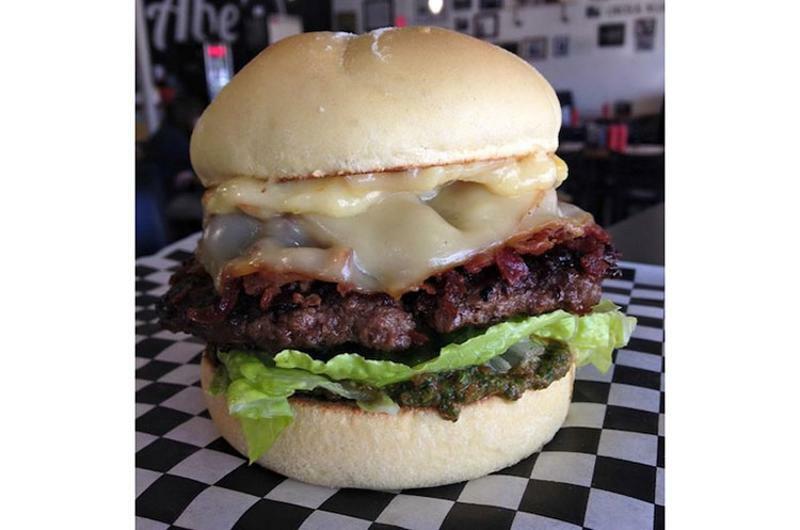 A beef patty smothered with pepper jack cheese, griddled tasso ham, spicy remoulade and plenty of hot sauce. 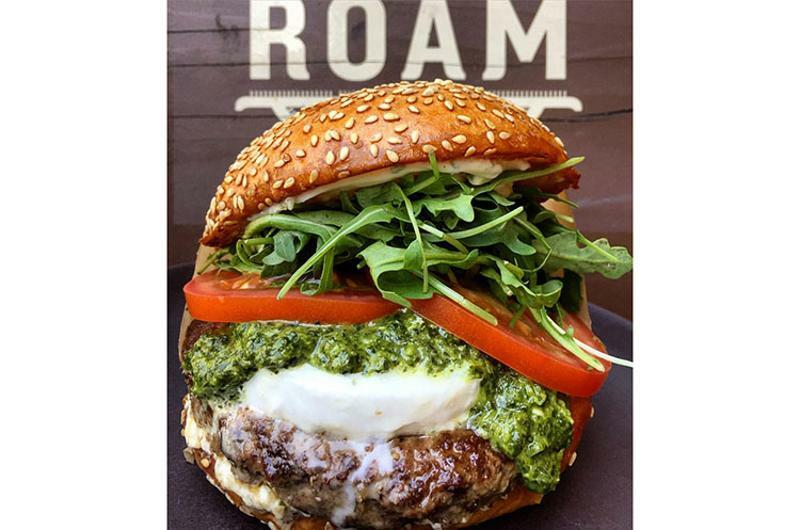 A beef patty with chimichurri sauce, arugula, herb mayonnaise and buffalo mozzarella. Beef, bacon, cheddar cheese, apple and onion slaw with chipotle aioli and apple cider gastrique. 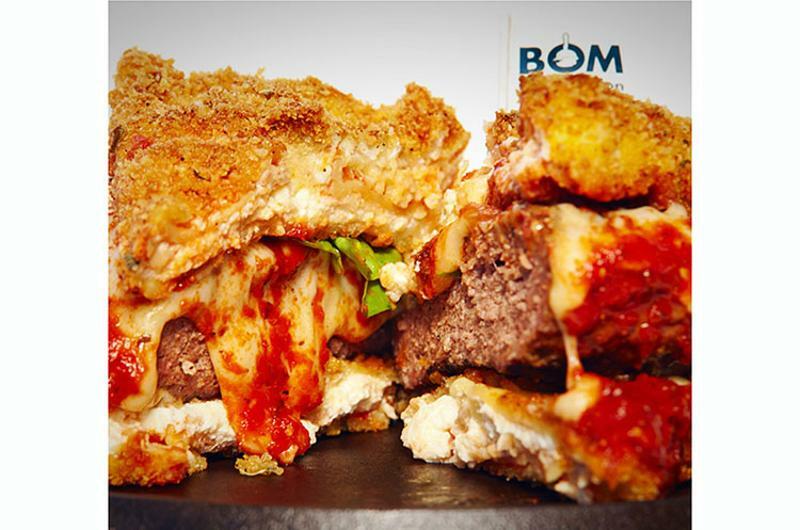 The burger boom is an international phenomenon. 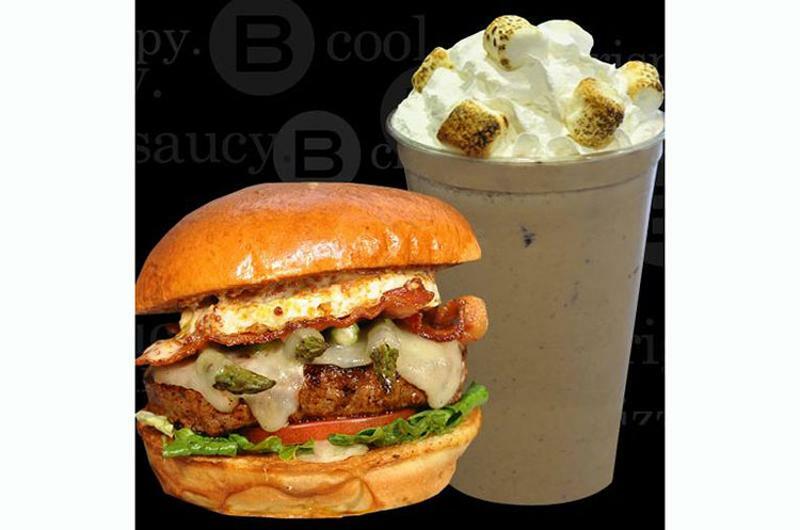 Burger bars have opened in every major market and they draw ingredients and ideas from their respective regions. 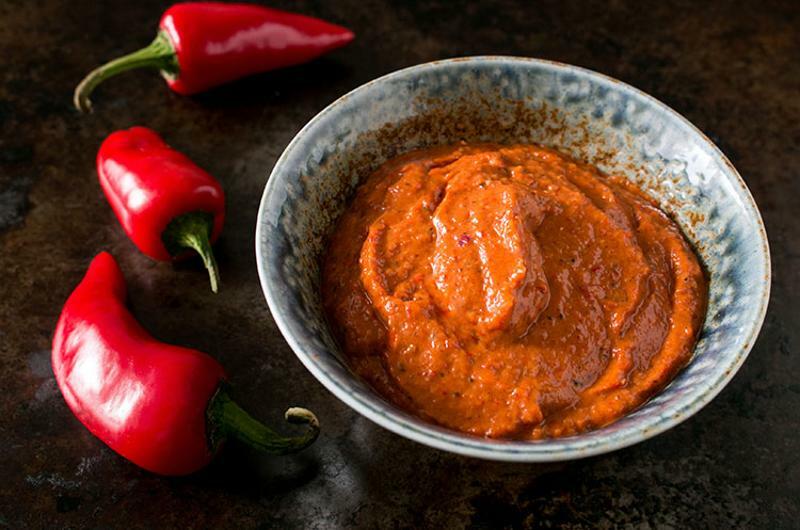 Global flavors are popular with consumers, and unusual ingredients, such as harissa spice paste, have become more easily sourced. 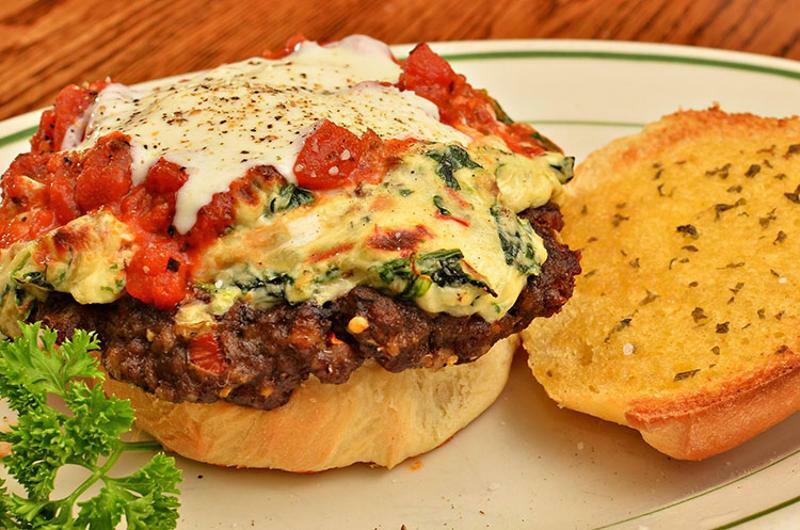 Beef patty with tomato, basil, extra virgin olive oil, basil-pesto mayo and provolone. 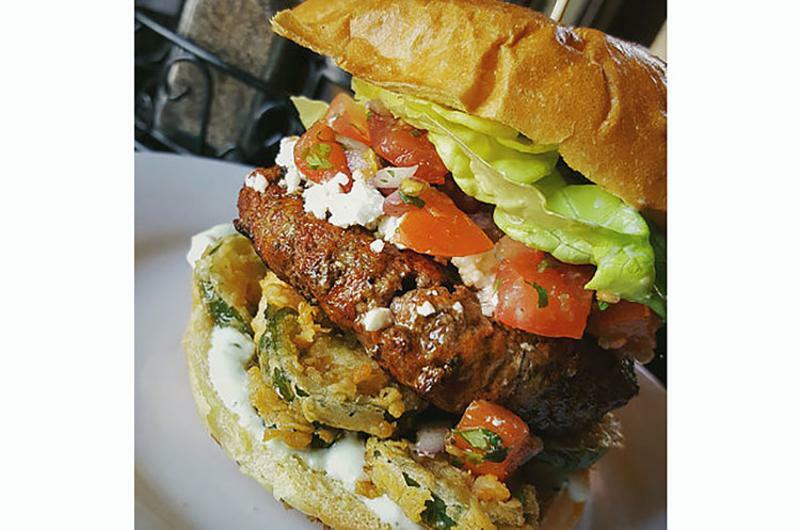 Restaurant: Meehan’s Public House; Vinings, Ga.
A 7-ounce patty of dry-aged beef and Mexican chorizo with queso fresco, pico de gallo, fried jalapenos, avocado-lime crema and butter lettuce on a toasted brioche bun. Restaurant: Big Orange; Little Rock, Ark. 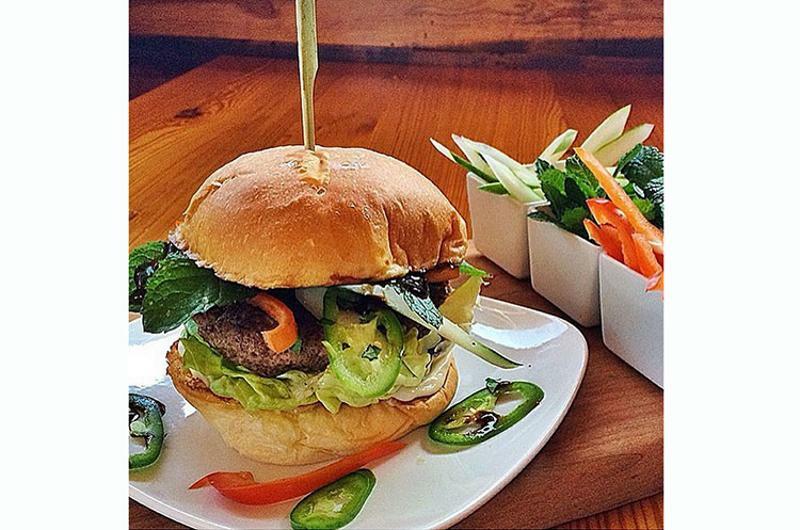 Beef or turkey patty with cucumber, mint, sweet hoisin sauce, jalapeno slices, red pepper slices, mayonnaise and butter lettuce on a locally made bun. Kobe beef, Thai salad, cucumber, jalapeno, avocado, Sriracha mayo and Korean barbecue sauce. 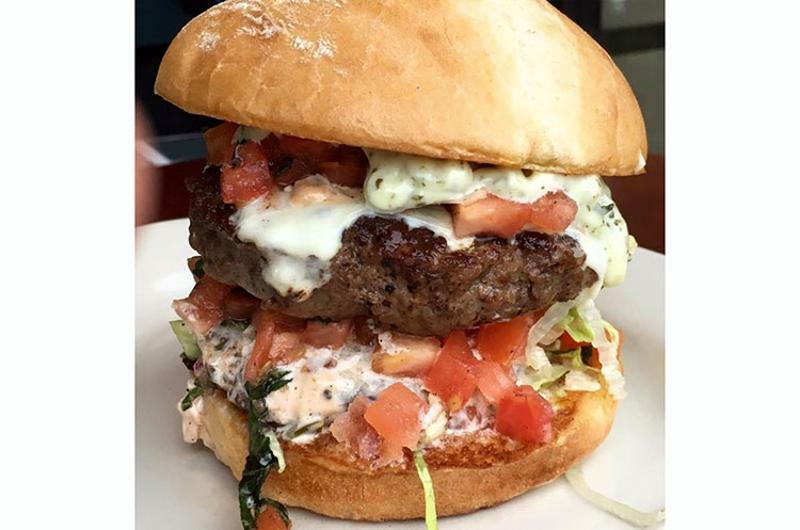 The first rule of burger-building is that anything edible can be a topping. 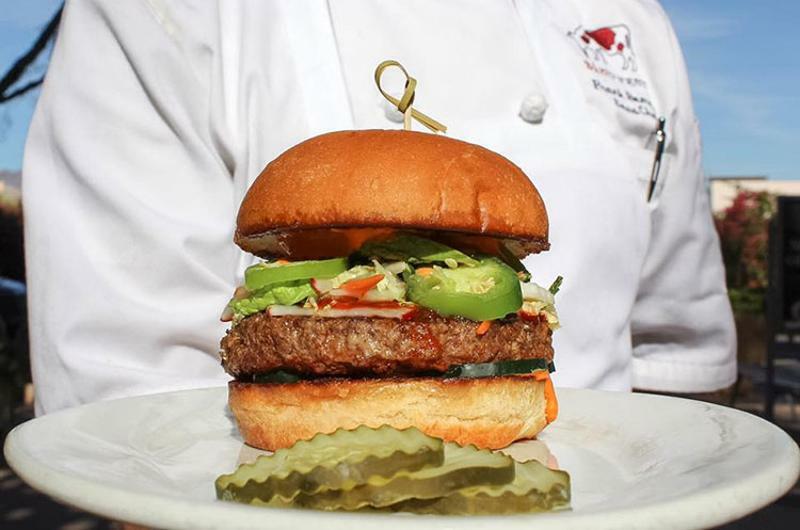 Lettuce, tomato and onion are fine if you’re making a classic burger, but restaurant chefs are looking around the garden and trying unexpected vegetables as burger complements. It’s an extension of the general embrace of fresh, local foods. 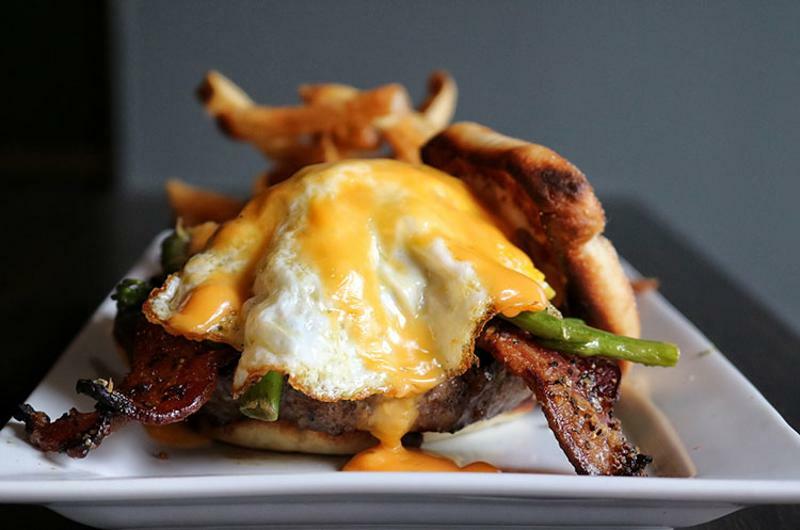 Beef burger patty topped with Gruyere, asparagus spears, bacon, lettuce, tomato, whole-grain honey mustard and an over-easy egg. 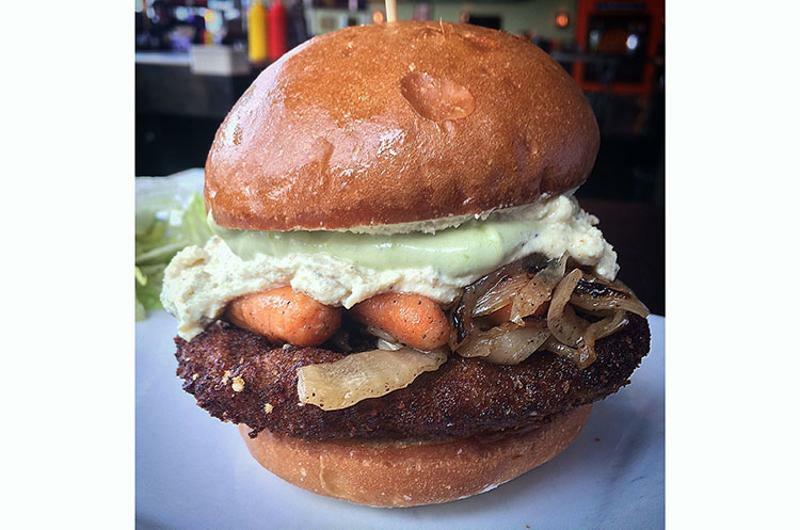 Herb-crusted lamb patty, roasted onions with baby carrots, Dijon ricotta and pesto mayo. 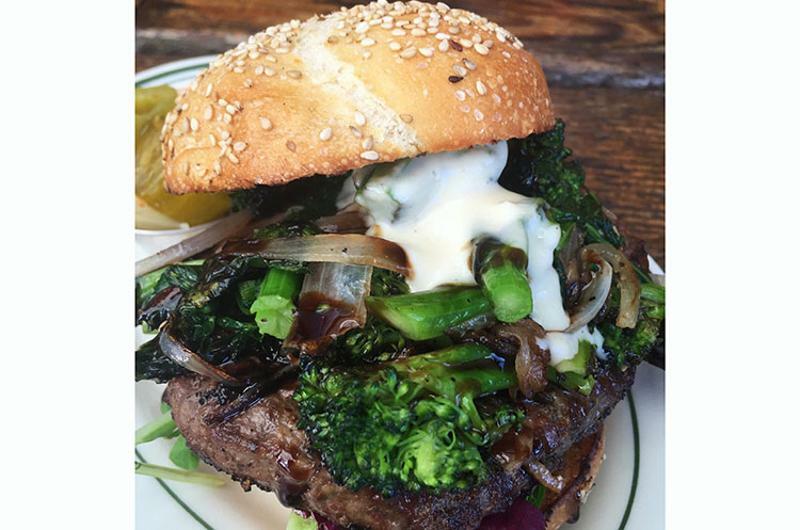 Restaurant: Victory Burger; Oakland, Calif.
A beef burger topped with lightly charred stalks of flowering broccoli, with roasted garlic mayo and balsamic reduction on a kaiser roll. 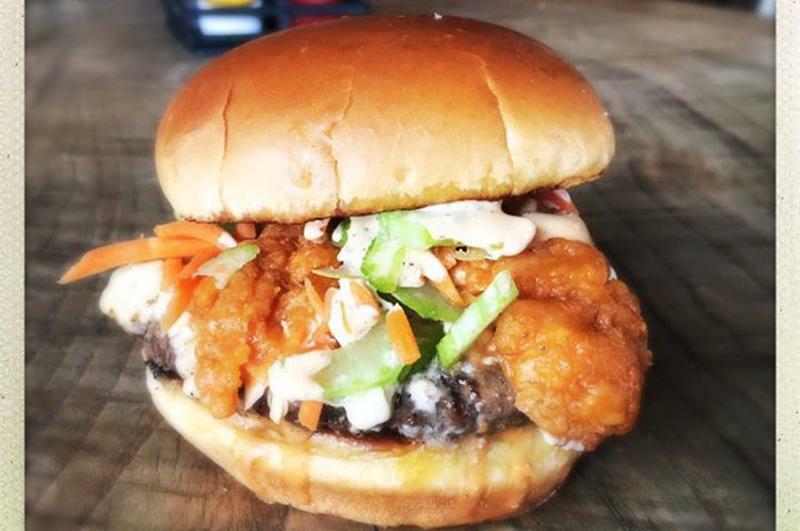 Restaurant: Holy Cow Del Ray; Alexandria, Va.
Angus beef, Buffalo chicken strips, blue cheese, hot sauce aioli, carrots and celery on a toasted brioche bun. 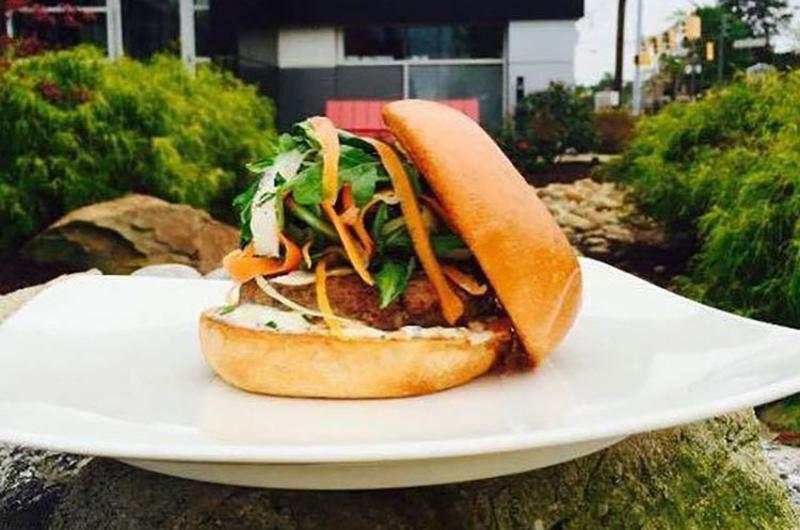 Lamb patty topped with an arugula salad mixed with garlic-pickled carrots, shaved onions and fennel, herb mix, red wine vinaigrette and rosemary goat cheese. Piling meat on meat first appeared as daring and outlandishly extreme, but it now is accepted as a mainstream burger-building approach. 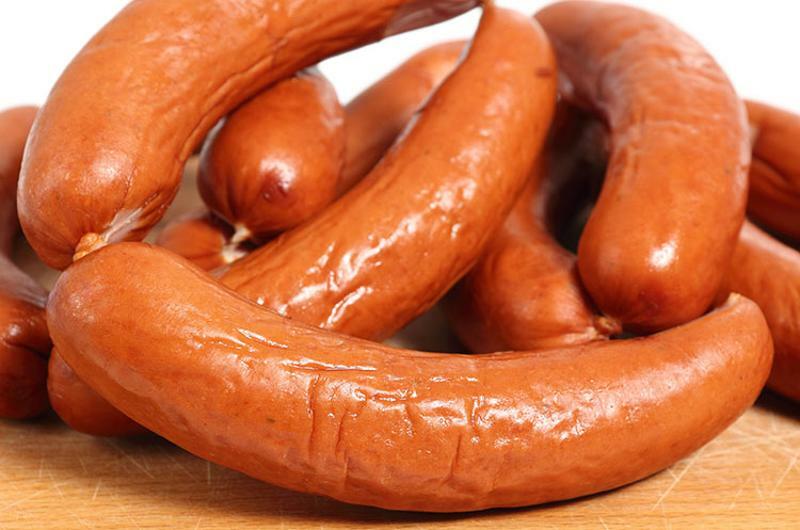 Whole sausages, sliced brisket or ham, pulled chicken and more can only boost a beef patty’s appeal—right? 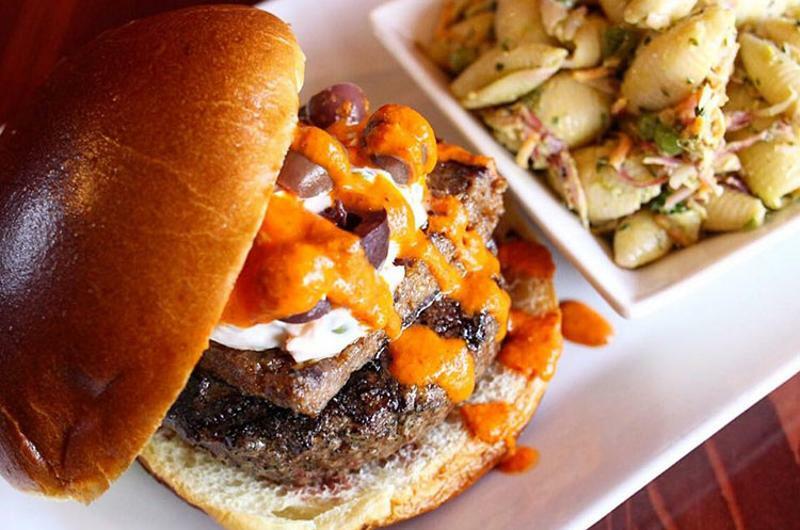 Beef burger topped with merguez lamb sausage, Kalamata olives, harissa and pea-and-mint Greek yogurt. 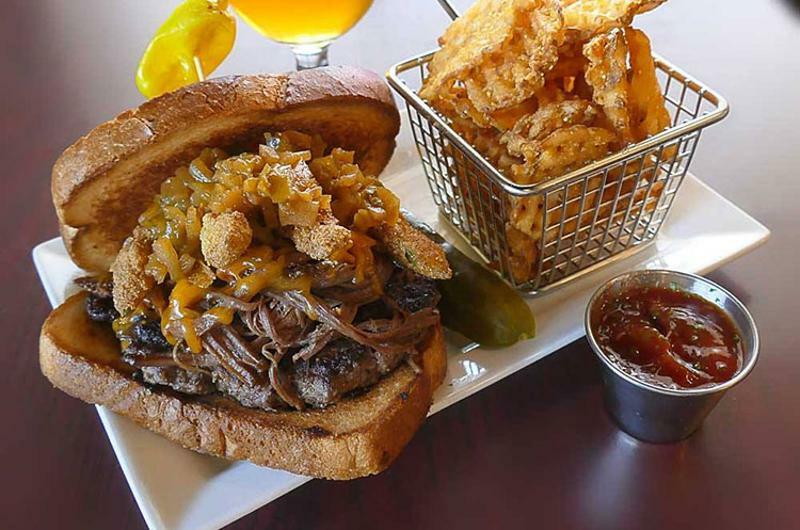 Restaurant: Hops Burger Bar; Greensboro, N.C.
House burger topped with a dry-rubbed beef brisket slow cooked in-house and brushed with barbecue sauce; smoked cheddar cheese; thinly sliced fried okra and jalapeno-apple chutney; served on Texas toast with waffle fries and mesquite ketchup. 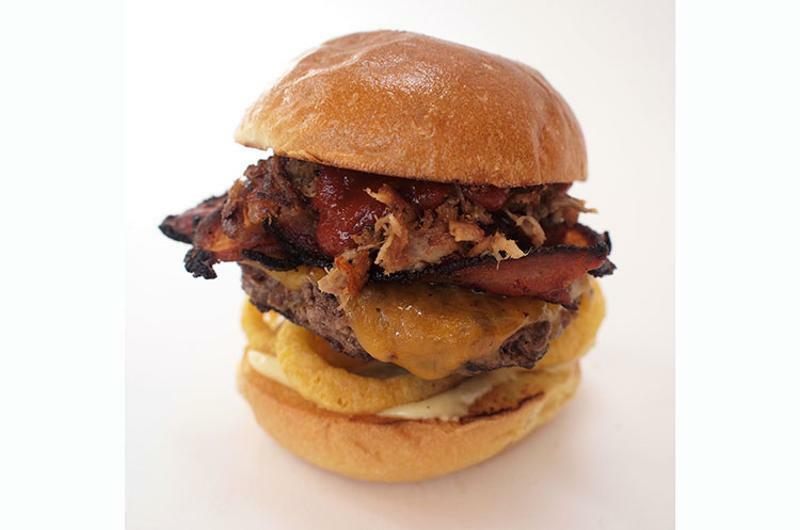 A half-pound beef burger topped with jalapeno bacon, cheddar, Funyuns, garlic aioli and seared pulled pork with barbecue sauce. 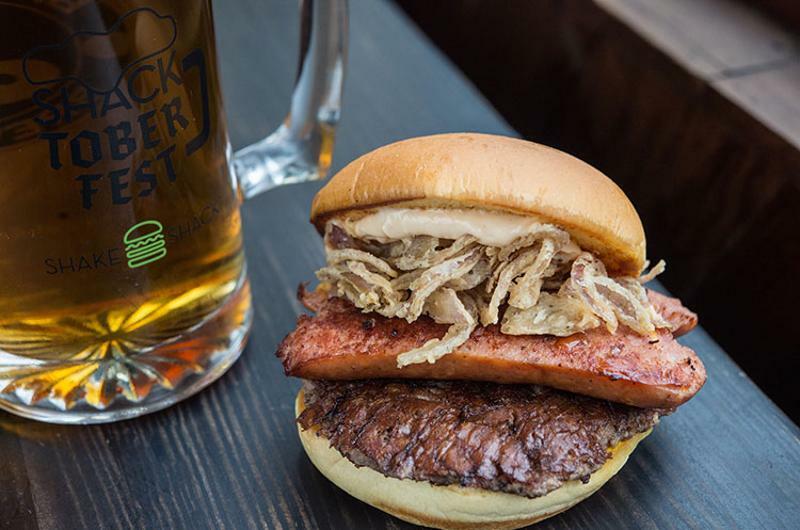 Beef burger topped with a flat top-griddled bacon cheddar bratwurst, crispy ShackMeister Ale-marinated shallots and ShackSauce. Local beef with cheddar and barbecue beef cheeks and jalapeno slaw nestled on a crispy fried wonton. 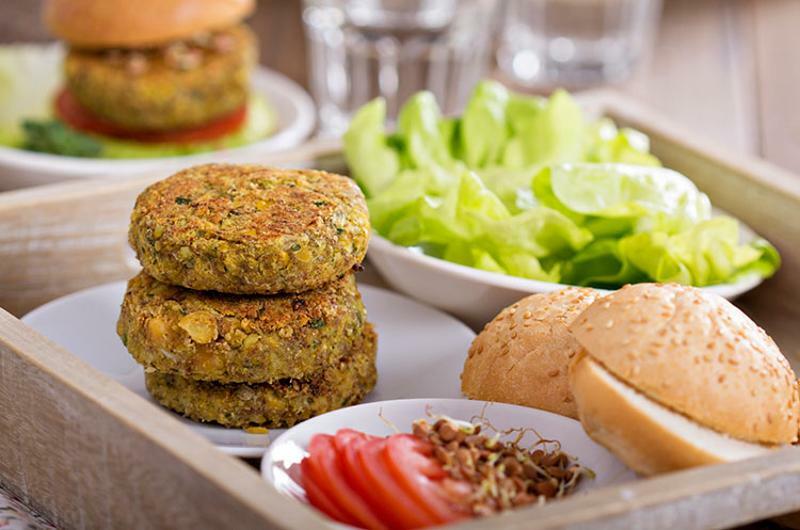 It wasn’t long ago that meatless burger patties were grudgingly offered and inattentively prepared. But those days are no more. 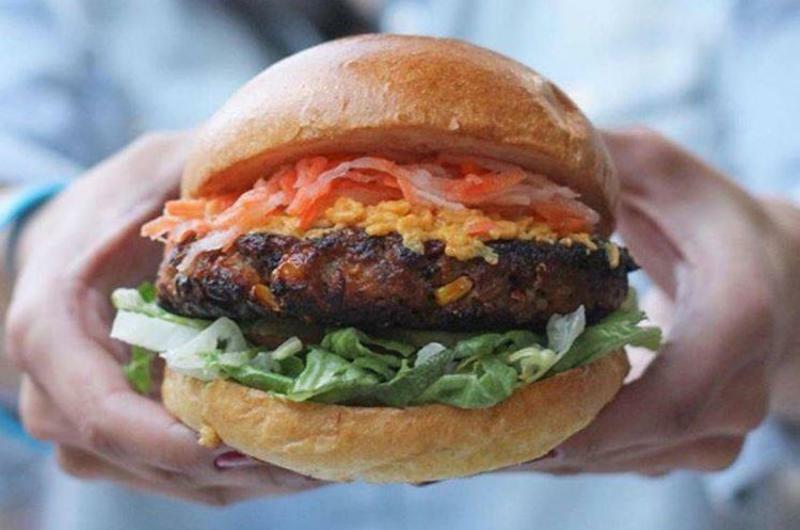 Meatless Mondays are real and customers don't have to be vegan to appreciate a good veggie burger. 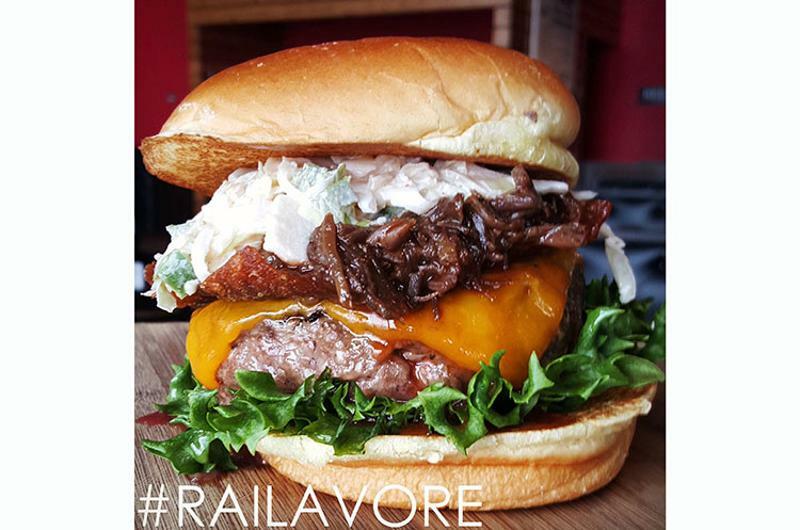 Most operators pride themselves on having appealing alternatives for those not interested in a carnivore burger. 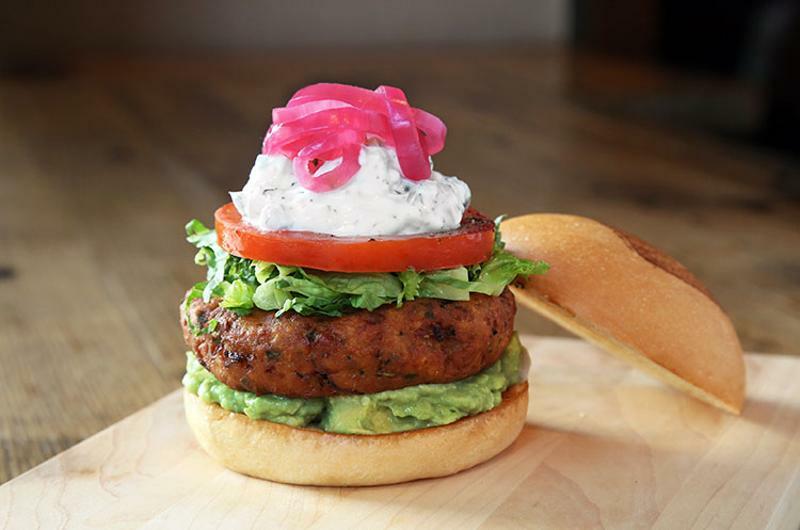 A ground chickpea patty stuffed with beet-infused couscous, topped with romaine lettuce, sliced tomato, tzatziki sauce, pickled red onion and crushed avocado. 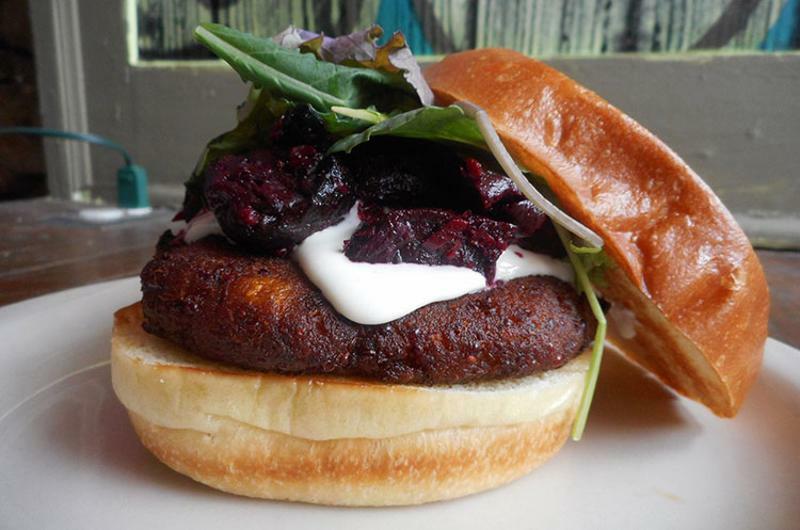 Restaurant: The Burger Stand at the Casbah; Lawrence, Kan.
A pumpkin-and-quinoa patty topped with goat cheese and housemade beet relish. 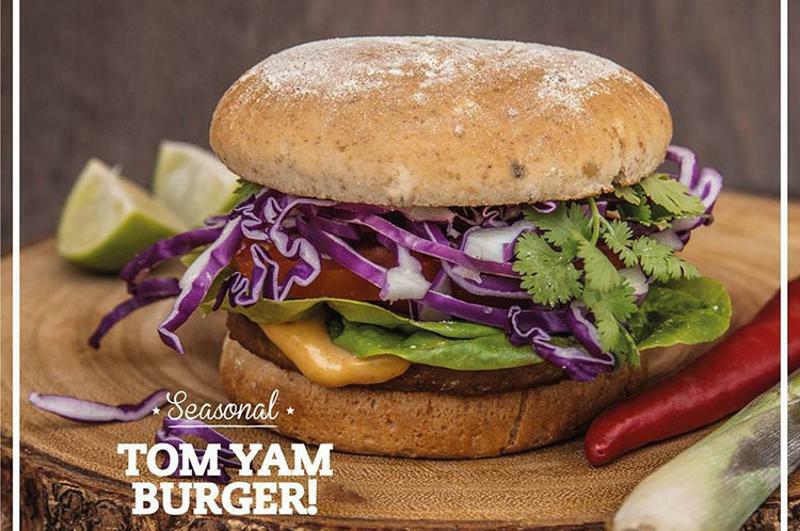 Crunchy vegan patty topped with Tom Yam sauce infused with lemongrass, chili peppers and ginger; topped with tomato, cilantro and red cabbage. 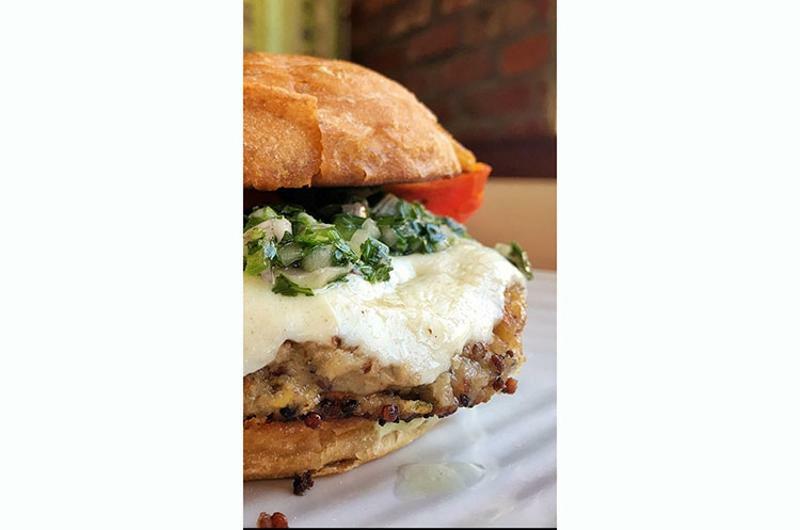 Quinoa patty with asadero cheese, jalapeno relish, roasted tomato and tomatillo aioli. Housemade vegan patty, sliced red onion, organic mixed greens, roasted red pepper, alfalfa sprouts and Dijon balsamic dressing on a multigrain bun. A major reason burgers continue to reign on menus is that they’re fun. They’re fun to create and fun to eat. 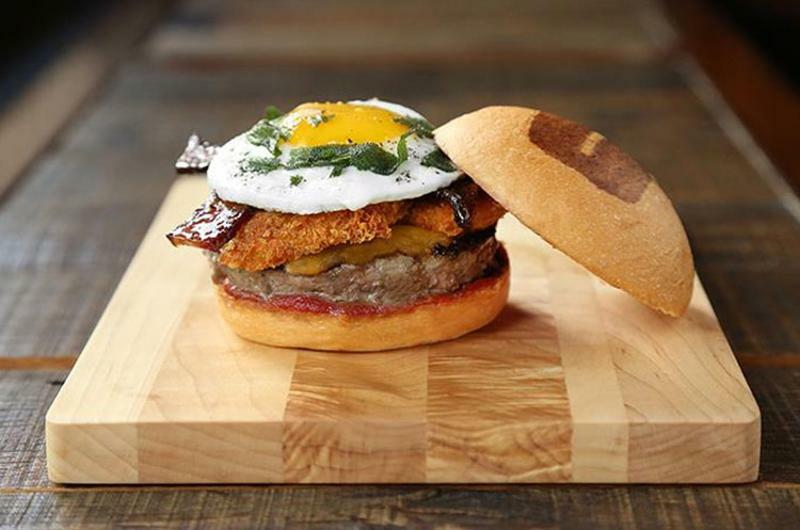 The funky-bun fad has settled into just another mainstream part of burger-building. Asking two personal-size pizzas to function as burger buns can be tricky, and no one would want to wrestle with that every day; but a crazy burger can be a draw, and on occasion, crazy good. 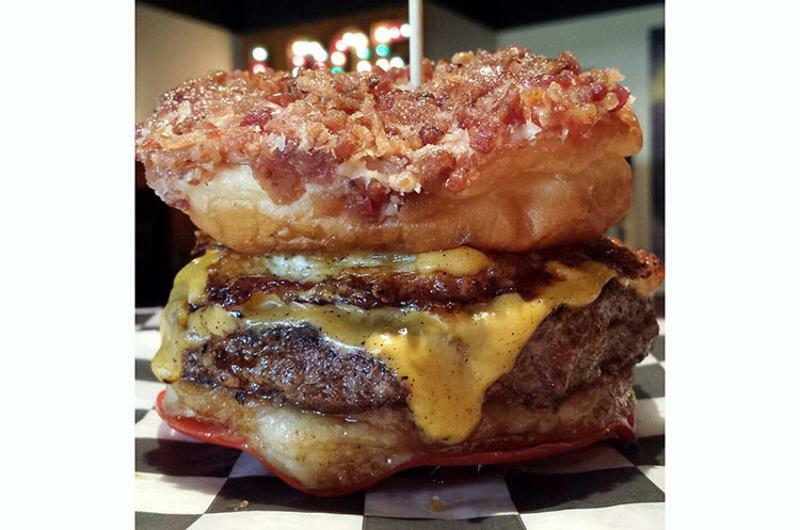 An 8-ounce beef-hot sausage blended patty on a glazed donut, topped with American cheese, a fried egg and a maple-bacon donut. Beef patty with thick-cut bacon, American cheese, iceberg lettuce, tomatoes, crispy onion petals, jalapenos, mayonnaise and spicy Angry Sauce on a red bun that gets its color from baked-in hot sauce. 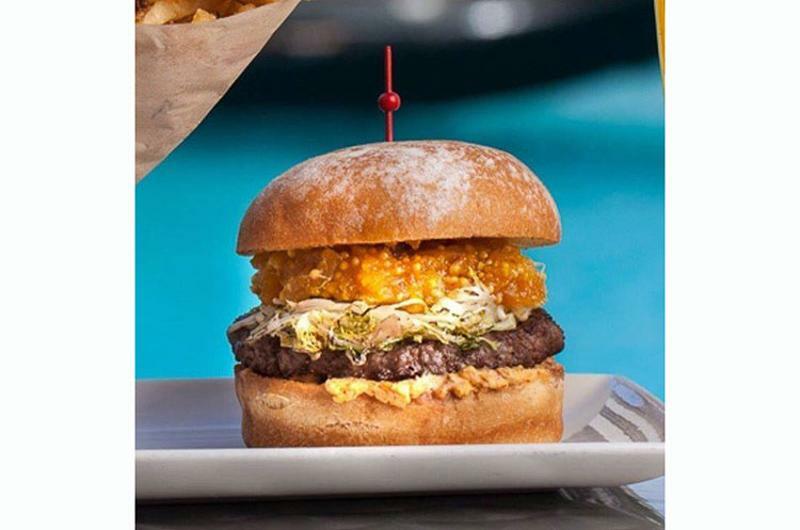 Beef burger topped with teriyaki and Chiu Chow (chili oil) aioli; chili-infused shredded cabbage, carrot and onion; and basil garnish on a ramen bun. 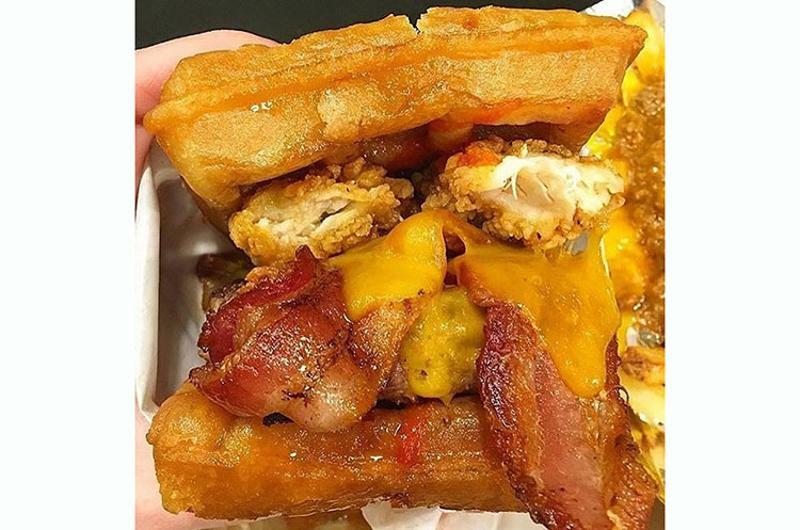 Restaurant: Grill ‘Em All; Alhambra, Calif.
Fried chicken, cheddar cheese, bacon, maple and Sriracha between two waffle buns. 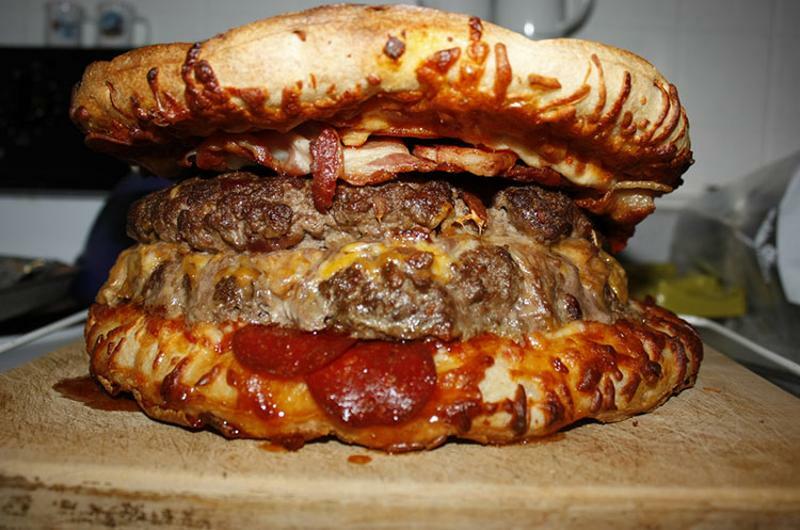 A patty made of ground short rib, chuck and brisket topped with marinara and vodka sauce, mozzarella cheese, bacon, pickles and crispy sandwiched between two personal-size pizzas as buns. 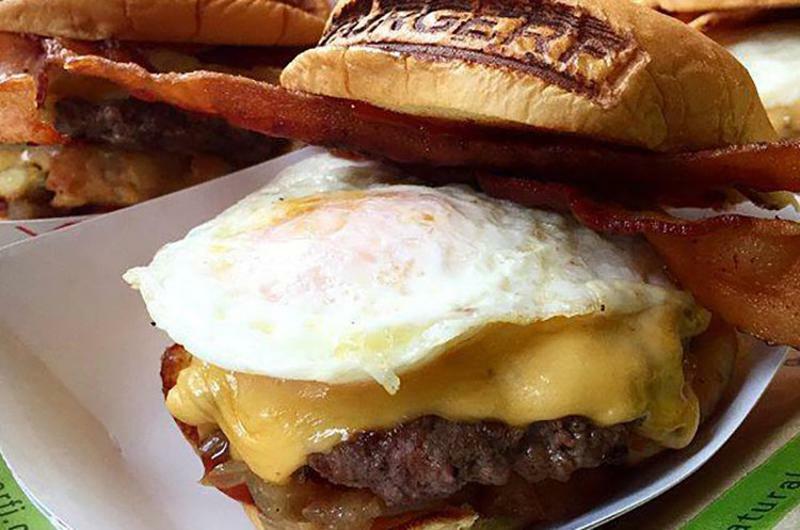 Egg-topped burgers blossomed as burger bars prospered and added weekend brunch service. And then, they became all-day choices, just as breakfast has. All the foods and flavors that make the most important meal of the day so popular work just fine with a juicy beef patty. 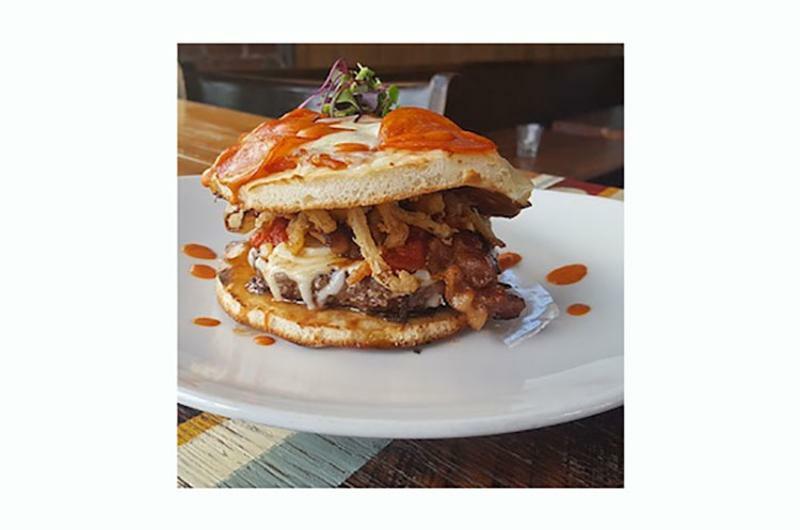 A special beef patty of house-signature beef mixed with bacon lardons, topped with cheddar cheese, miso-maple bacon, smashed cheesy tots, a fried egg, fried sage and a housemade coffee ketchup created by Alton Brown himself. Toasted English muffin, Broccolini, melted cheddar cheese spread, fried egg, pico de gallo, garlic aioli and house-cured bacon. Brisket and potato hash, fried egg in onion ring, aged cheddar and habanero mayonnaise on a brioche bun. 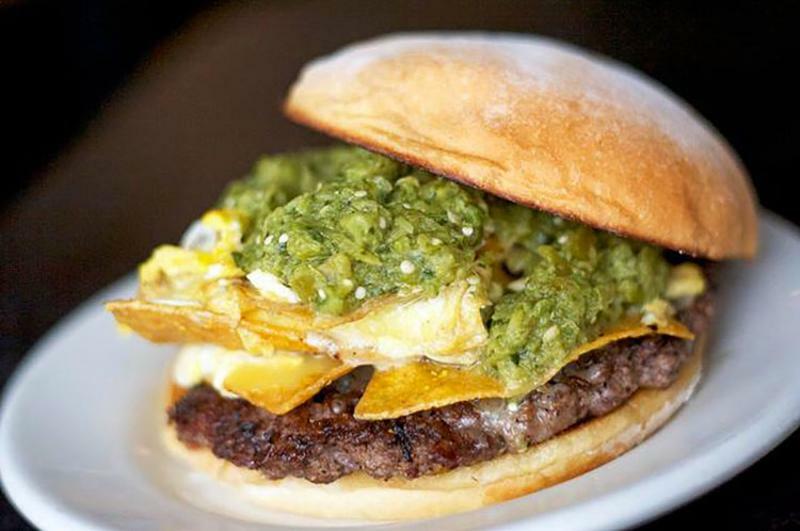 Grass-fed beef, scrambled eggs, jalapeno, tortilla chips, salsa verde and Jack cheese. 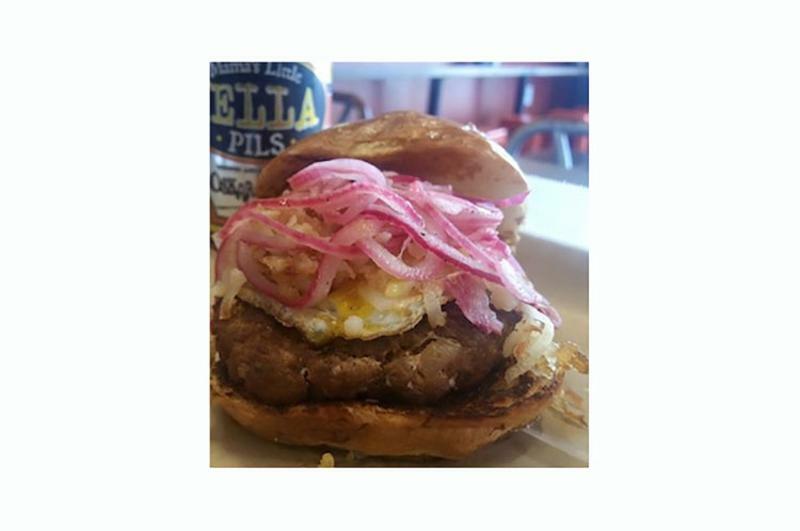 Restaurant: Social Burger; Vienna, Va.
Housemade spicy pork chorizo patty with a fried egg, hash browns and pickled red onion on a potato roll. Is a grilled chicken breast served on a bun a burger or a sandwich? 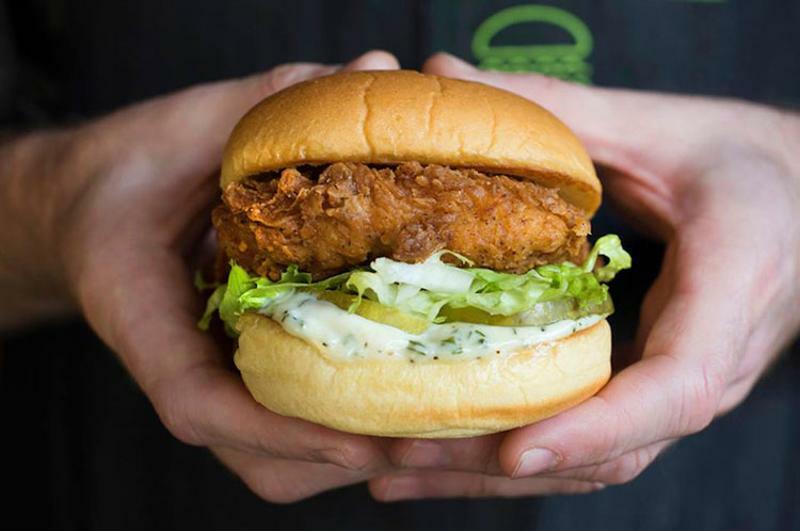 The debate continues, but what’s undeniably true is that chicken burgers have achieved a level of respect at burger restaurants that they never were granted before. 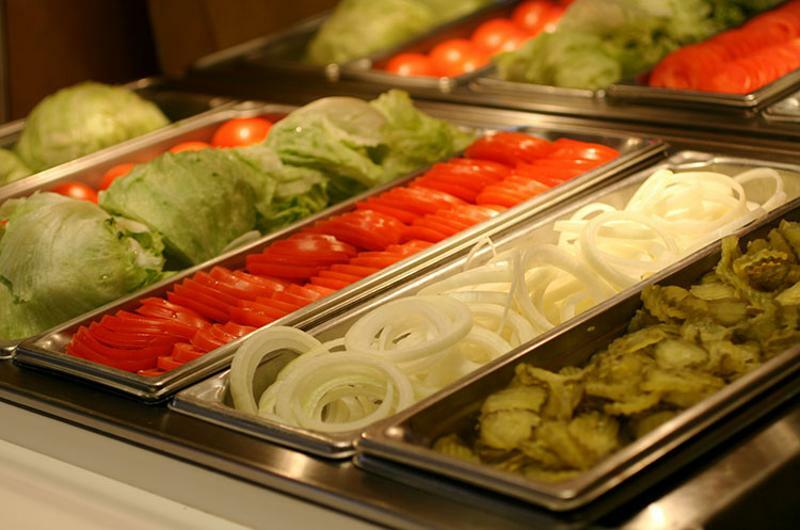 Chicken and turkey used to get lettuce, tomato and mayonnaise and little else. Now they’re getting all dolled up just like beef burgers. 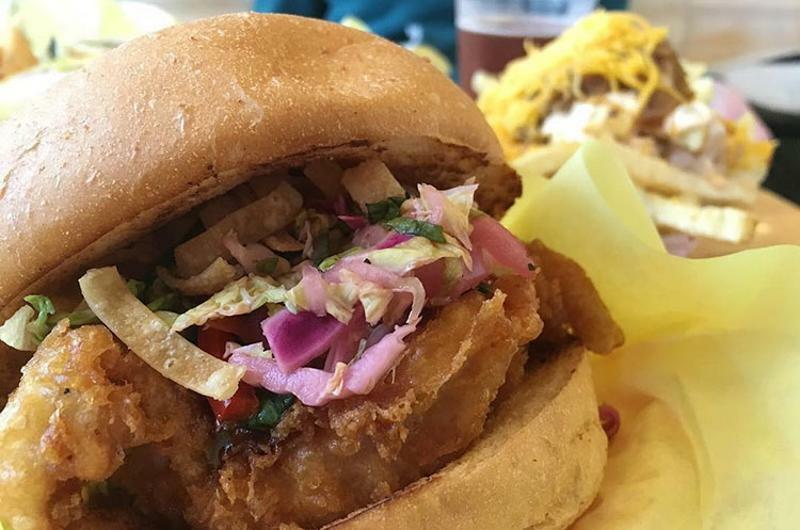 Tempura-fried chicken breast topped with Mandarin barbecue sauce, Asian slaw, fried wonton strips and garlic aioli on a pan de sal bun. 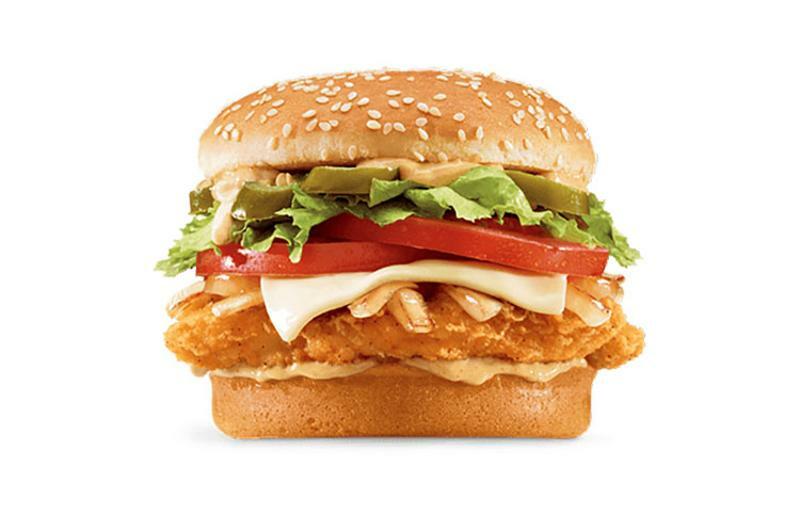 Spicy chicken fillet, grilled onion, sliced jalapeno, Swiss-style cheese, lettuce tomato and ghost pepper ranch sauce on a seeded bun. 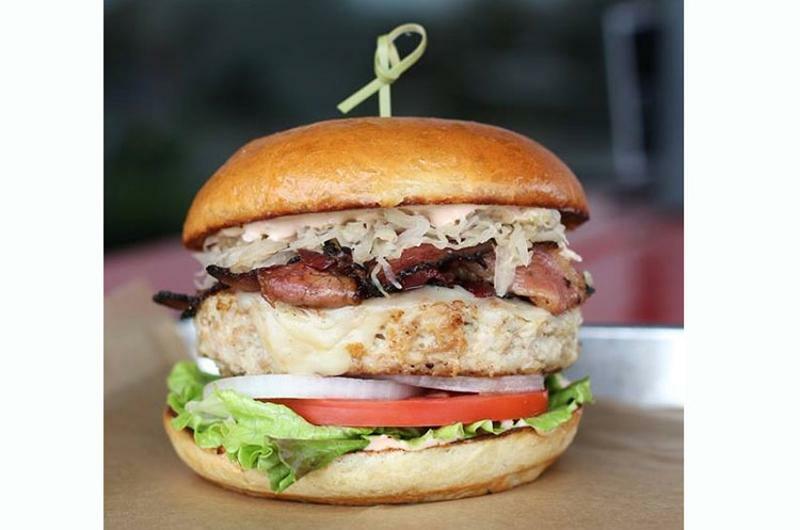 Chicken patty with Swiss cheese, pastrami, beer-braised sauerkraut and Russian dressing on an egg bun. 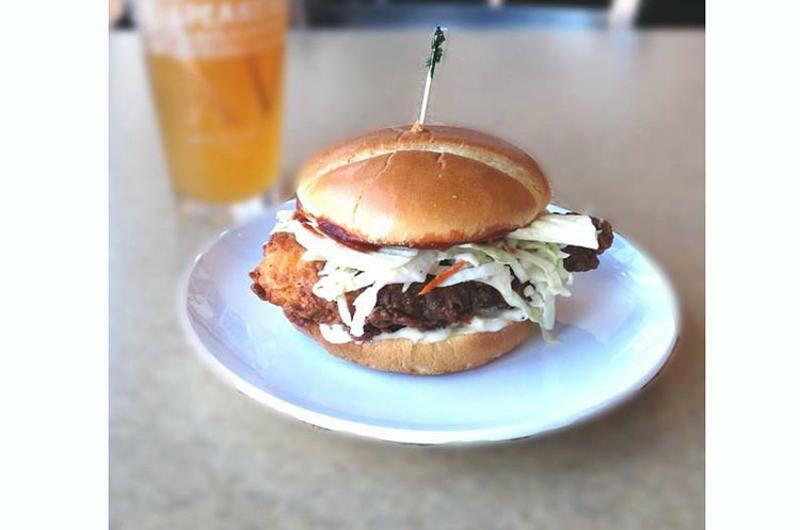 Hand-battered buttermilk fried chicken with house-made South Carolina-style coleslaw, sage mayonnaise, barbecue sauce and rippled potato chips, served on a fresh brioche bun. 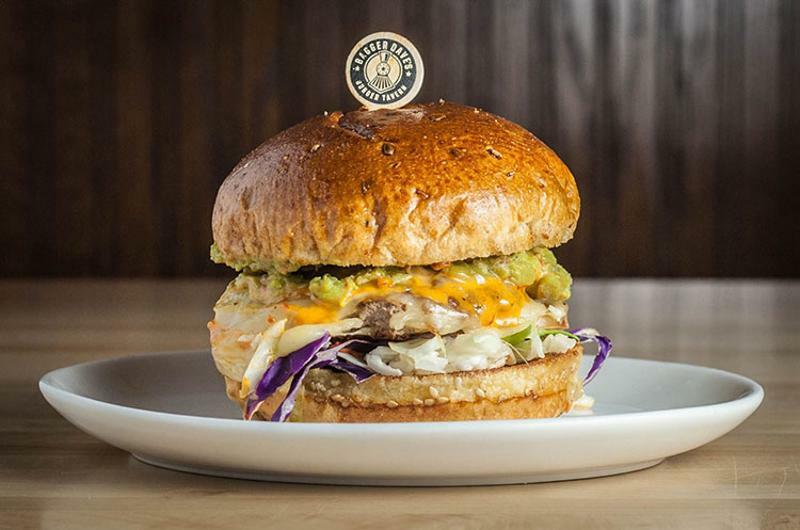 Two turkey patties, pepper jack cheese, coleslaw, tomato and guacamole, served on a grilled nine-grain wheat bun. 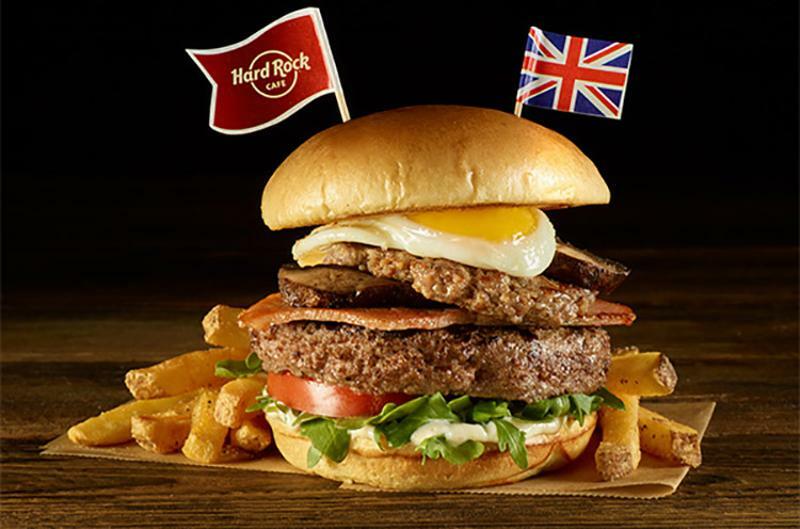 A generation ago, a double-decker burger was on the edge. 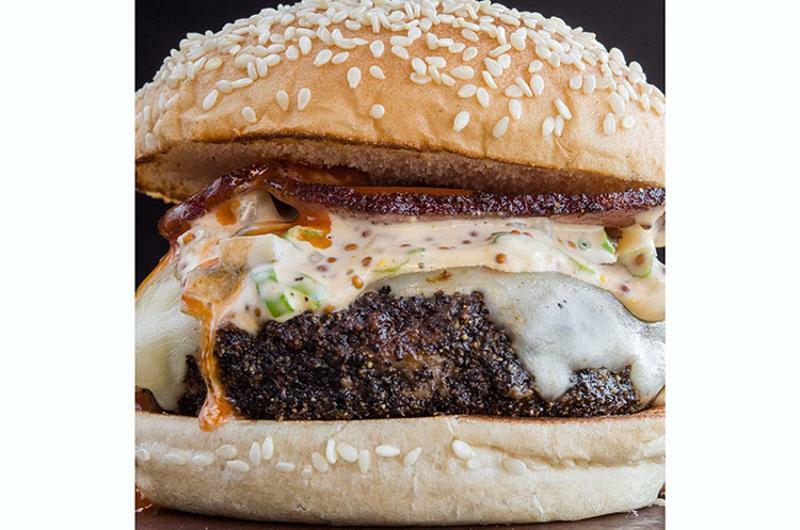 Now there is no edge: Burger chefs seem to be trying to out-outrageous each other. Over-the-top combinations of ingredients may be difficult to eat, but they're undoubtedly craveable. 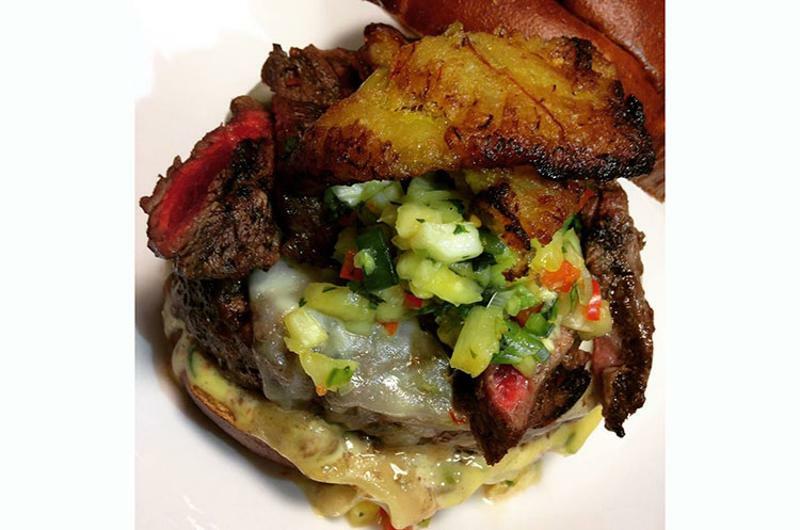 Restaurant: Kuma’s Corner; Schaumburg, Ill.
A 10-ounce beef patty topped with Jamaican jerk flank steak, honey-whiskey-jalapeno aioli, bourbon-glazed fried plantains, pineapple salsa and pepper jack cheese. 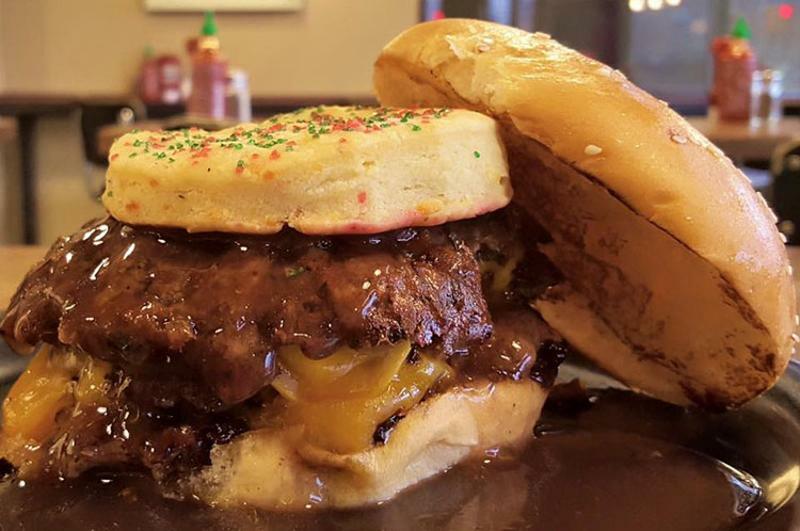 Beef patty, white cheddar shortbread cookie, venison-juniper sausage, cheddar and mulled wine gravy. 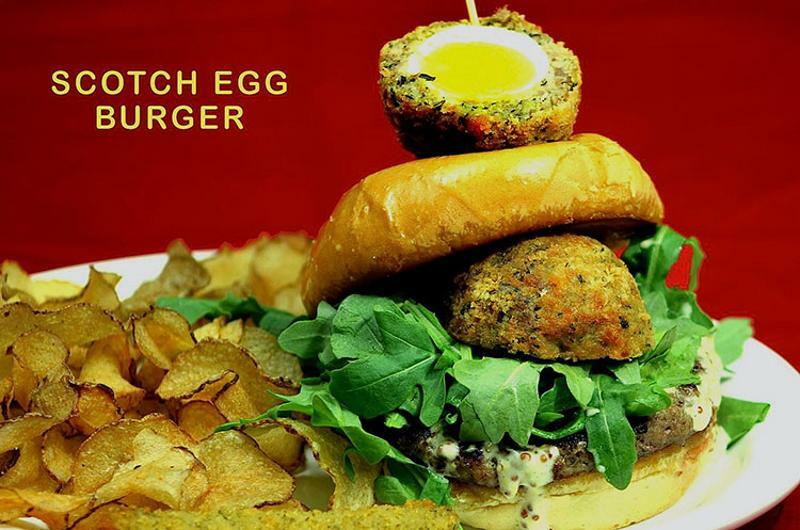 Chargrilled Ohio grass-fed beef patty topped with arugula, housemade beer-mustard aioli and a housemade Scotch egg, served on a butter-toasted bun with house chips and a fried dill pickle. 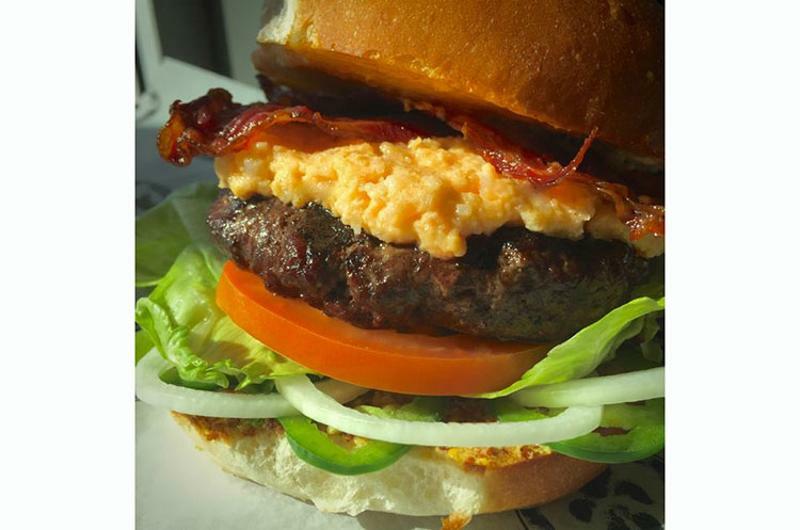 A house-ground beef burger with shrimp dip, boar bacon, jalapeno, onion, lettuce and tomato, spicy mayonnaise and Creole mustard on a house-baked bun. 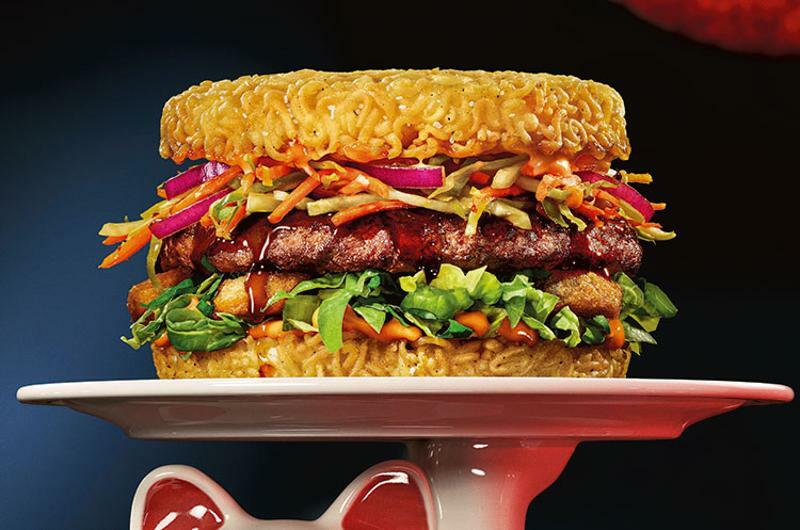 Every element of the basic burger build has been reconsidered and creatively liberated. That includes cheese. 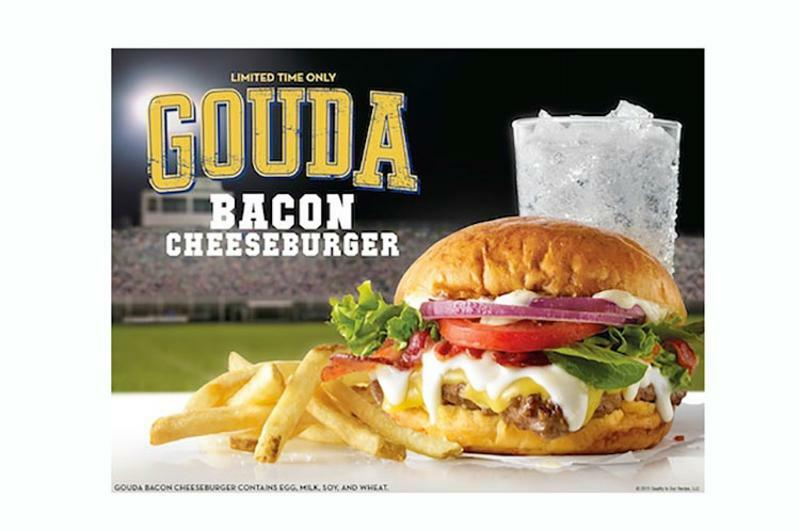 Where American cheese once was the only choice, a variety of cheeses are being woven into restaurants' burger recipes. 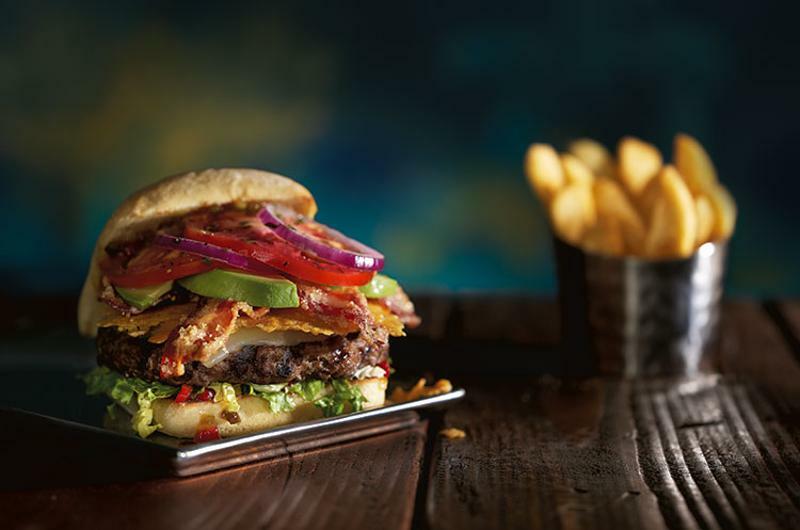 A half-pound beef patty with melted provolone and Swiss cheese, a cheddar and Parmesan cheese crisp, jalapeno relish, candied bacon, avocado slices, a blend of citrus-marinated tomato and onions, and shredded romaine served on a toasted ciabatta bun. 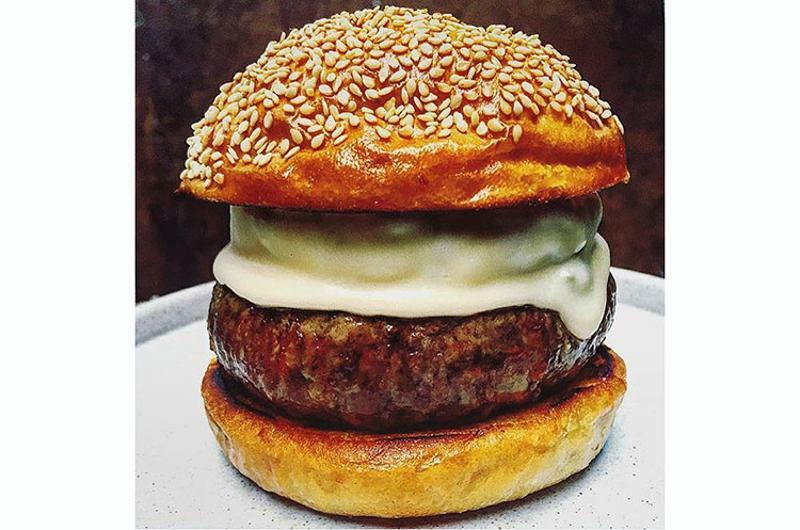 Beef patty topped with ramp butter, taleggio cheese and slow-roasted red onions cooked in beef tallow. A quarter-pound beef patty topped with a creamy garlic aioli, Gouda cheese and warm Swiss Gruyere cheese sauce, three strips of applewood-smoked bacon along with red onion, tomato and fresh spring mix, all served on a toasted brioche bun. 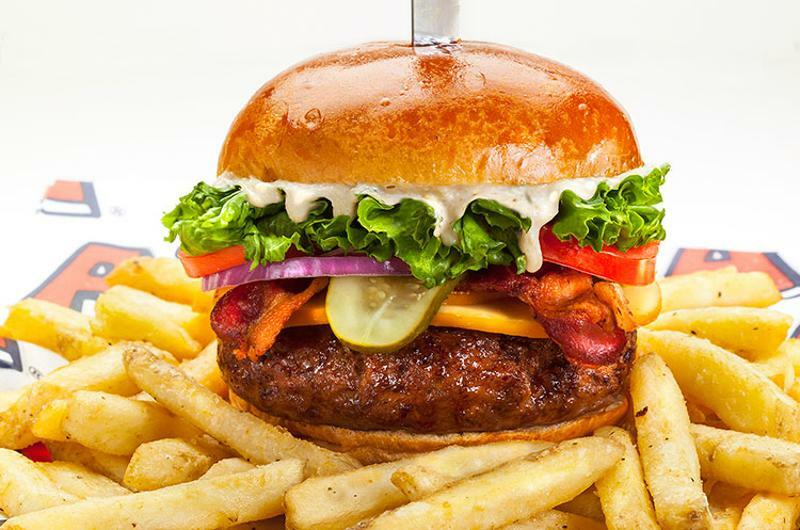 A burger topped with horseradish mayonnaise, smoked Gouda cheese, applewood-smoked bacon, lettuce, tomato, red onion and pickle. 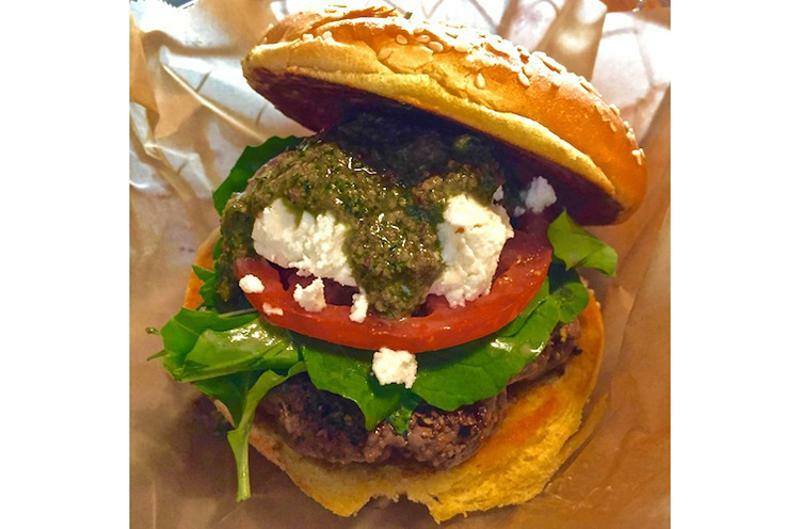 Restaurant: Farm Burger, Huntsville, Ala.
Grass-fed beef patty with goat cheese, pecan pesto, marinated tomato and arugula.